Some may know of this project, but here is a link to the Great Migration study that is looking at New England, and all of the families that arrived, from 1620-1640. The study proposes that Margaret was Thomas' second wife; we'll continue with Dr Frank A's hypothesis (Margaret arrived with Thomas at Cape Ann in 1624) until proven otherwise. While looking at some issues with one family, one researcher referenced what was written by this project. In a sense, it may be the new bible concerning the early times. Don't worry, we'll check this work out. In one case, I've already noticed an oversight. But, trying to address that type of thing will await some more review. 03/03/3015 -- Updated the link to the NEHGS copy of Great Migration. Seems that everyone is converting to please the mobile crowd (not always improvements). See, too, Zouch Phoenix. 10/03/2014 -- Dr. Frank A. will feature in the future. Was he right about Thomas and Margaret (their marriage record found, recently)? Why did the Great Migration Project ignore him? 06/19/2013 -- NEHGS rearranged their database. Today, updated the link for the 6 pages. Added the image of the first page. 07/21/2011 -- From whence? Coffin, from Nantucket, said Dorset (Sherborne). Finally got around to filling in Dr. Frank's tree, using WikiTree. His Gardner line is fairly complete, in terms of data entry. Starting to fill in his Woods (maternal) line using Dr. Frank's handwritten notes. The focus now for this work is having nodes (profiles) in place and linked (pick the Ancestors button). Then, we'll be adding bios, etc., plus verifying sources, as in, this will be the 'bible' of his lineage. We fill in sources as we go along adding profiles - to be extended later with further research by Gardner Research. However, we don't own all of the profiles, so we need to double check those. So far, finding interesting stuff, like - Dr. Frank is a descendant of Demaris, too, the last wife of Thomas. Gardner pedigree for Dr. Frank and his sister, Lucie M. (with ahnentafels of their grandfather, Benjamin Brown Gardner, and grandmother, Lucy FosterWilson). Several posts have mentioned Dr Frank A. We will use his line quite often as we fill in the tree. The 'Read online' option provides a nice interface that has a fast search; the results are given with easy to use bookmarks. See next, for an example. Dr Frank's book gives descendants for Essex County and New England "lines to the eighth generation and Nantucket lines through the fourth generation" and includes his father's siblings (page 286 has information about Dr Frank's father, Stephen Wilson Gardner, and his mother, Marion Wallace Woods). Fortunately for us, this book provides sources which is important for resolution of questions. In many cases, records are missing for a variety of reasons in many areas. Essex County seems to have been able to preserve a lot of their records. The Gardner families were spread widely, according to the book. It will be interesting to see the locations mapped out as they were at the time of the book and at this later time. 09/15/2018 -- Gardner Research published four articles in The Essex Genealogist. These were republished in The Gardner Annals which just released Vol. IV. Last fall, we printed TGA Vols I and II. Soon, we will print Vols III and IV. Included with the TGA were Gardner's Beacon issues. Of late, we have experimented with one approach to a database, namely WikiTree using Dr. Frank's information. As mentioned in that post, we have established that Thomas had two wives as we found information about the marriage of Thomas and Margaret in Sherborne, Dorset, UK. 09/07/2018 -- Added note at the top about the WikiTree work. 09/08/2016 -- People in Dr. Frank's book. 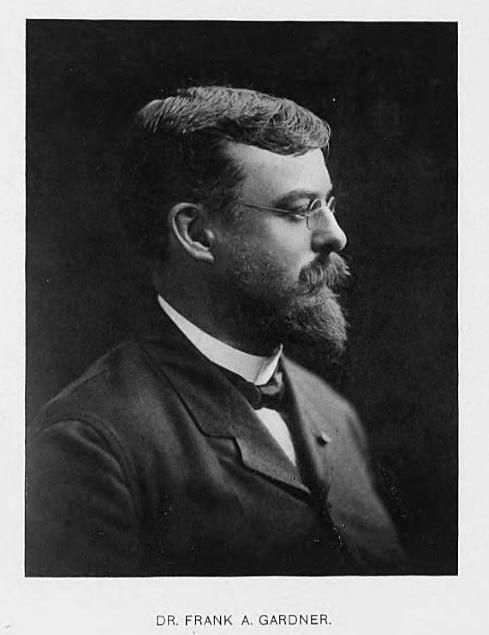 12/17/2015 -- Life of Dr. Frank is featured in The Gardner Annals, Vol. II, No. 2. 12/13/2015 -- Find A Grave - Gardner. 05/21/2105 -- We will feature Dr. Frank in our research. For now, we have the ahnentafels (fully sourced) for his paternal grandparents. One of his activities was editing and promoting The Massachusetts Magazine. 03/20/2015 -- Add links to the on-line copy of the books (1907, 1933). Fix a stale pointer. 03/12/2015 -- Image from 1933 book (7 pages) on Gardners. 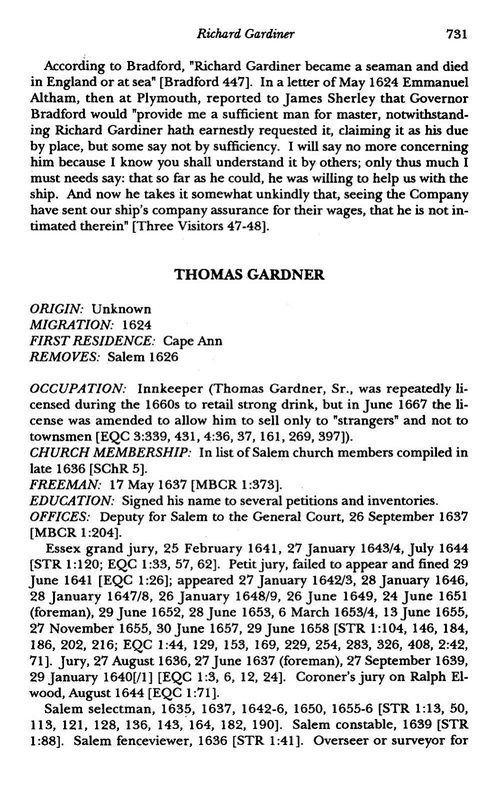 03/11/2015 -- Sourced ahnentafels (published in TEG and The Gardner Annals): Thomas Gardner of Salem descendant (Benjamin Brown Gardner - grandfather of Dr. Frank) and Thomas Gardner of Roxbury descendant (Susan Charlotte Graves Gardner - aunt of Dr. Frank). 02/27/2015 -- Dr. Frank's paternal ancestry completed. Turns out that Dr. Frank is a descendant of Nathaniel Eaton. Being degreed in the theological framework, as well as having the M.D. and a general Ph.D., puts him in a different light, one might think. 01/03/2015 - Note, Dr. Frank A. 's Gardner Memorial book is digitized and on-line (Hathi Trust). 08/29/2014 -- Dr. Frank's grandmother's ahnentafel (six generations, fully sources for births and deaths). 04/29/2014 -- Dr. Frank's grandmother, Lucy Foster Wilson. 11/13/2013 -- Phippen would be part of the slate fill. 06/15/2013 -- John Farmer wrote that Thomas was from Scotland. Origins are, and will be, a focus. 12/25/2012 -- Added Google Docs version. 12/24/2012 -- Thomas, unlike Conant, was not overshadowed in the world of being. We'll spend some time characterizing this fact and what it means to reasonable folks. 08/07/2011 -- At a later time, we'll look more fully at Dr. Frank's tree, such as this one of his grandmother, Lucy Foster Wilson (Goldthwait, Adams, Conant, ...). 05/08/2011 -- The image is from page 74 of Dr Frank's book where he mentions notes for a future book. It would be interesting to see these notes. Where might they be? As mentioned before, we want to spend a little effort getting information about the earlier times before coming toward the current era. For instance, we can take some time to look at each of the kids and their offspring. Sarah, the oldest daughter, married Benjamin Balch whose father, John, was one of the early planters who came over with Thomas Gardner. This group helped establish the area around Salem. There is a house in Beverly, called the Balch house, that has been dated to about 1680. Part of it may have been built by John. Sarah and Benjamin were occupants, to boot. Notes from Balch family reunions, some of which were attended by Dr Frank A Gardner, provide stories of interest. For instance, Benjamin, born in 1743, was the first Chaplain of the Continental Navy. Another descendant, John Henry Balch, was awarded the Medal of Honor for his actions in WWI. One pedigree for Rev. Benjamin, who descends from Sarah's son Freeborn, includes the Woodbury (another planter) family (Kappus). The Vaut pedigree has an interesting extension for Thomas. 05/21/2011 -- One of the cousins was a descendant of Sarah. 04/23/2011 -- There will be additional posts on Sarah's descendants. 03/17/2011 -- Another descendants list (Langsdorf, et al). 02/20/2011 -- See Dr Frank's book, pg 20, for information about Sarah. Also, Sarah and Benjamin's offspring are covered in the Balch genealogy book.